NYC band Versus’s newest album, On the Ones and Threes, was released this past Tues­day. A great new addi­tion to Versus’s exten­sive list of albums, sin­gles, EPs, and com­pi­la­tions, On the Ones and Threes is Ver­sus once again at the top of its game, fol­low­ing its long leave of absence. Ver­sus is quite clear­ly still heav­i­ly entrenched in the ‘90s, but giv­en the excel­lence of the album, that’s cer­tain­ly not a bad thing. Richard Baluyut and Fontaine Toups share vocals on On the Ones and Threes, with a deliv­ery that is calm­ly flu­id, alter­nate­ly flow­ing along­side the superb instru­men­tals and pro­vid­ing them with an intrigu­ing con­trast. Both Baluyut and Toups are excel­lent alone, but the height of the album’s instru­men­tals is in the vocal har­monies cre­at­ed by the two togeth­er. On tracks like “Nu Skin,” this is akin to an addi­tion­al instru­ment. Whether the vocals act in that way, sim­ply as accom­pa­ni­ment, or in the front-line role that best does them jus­tice, they are always fur­ther devel­op­ing an already rich musi­cal land­scape. While at first many of On the Ones and Threes’ lyrics seem to make lit­tle sense, on a close lis­ten­ing, it becomes obvi­ous that Ver­sus has done a com­mend­able job at both incor­po­rat­ing com­plex imagery into the lyrics and mak­ing those images fit the music seam­less­ly. Whether the band’s describ­ing soli­tude as a vac­u­um or singing “Sev­en long years / I’ve been left for dead” on “Cica­da,” it quite sim­ply works. On the Ones and Threes rarely falls into lyri­cal traps such as over-rep­e­ti­tion or un-orig­i­nal­i­ty - even when it repeats, it’s done cre­ative­ly enough not to bore. On the Ones and Threes is, judged sole­ly on instru­men­tals, one of the most inge­nu­itive albums recent­ly released. Begin­ning with the excel­lent blend­ing of gui­tar and oth­er strings on the first track, fol­lowed with the sur­pris­ing, but per­fect­ly fit­ting, pro­longed solo-instru­men­tal sec­tion of “Nu Skin,” and last­ing through the min­gling moods of the album’s final track, “The Ones and Threes,” the album’s instru­men­tals remain engross­ing, extreme­ly ener­getic, and per­fect­ly designed. Ver­sus moves through sec­tions with expert tim­ing to per­fect­ly engage the lis­ten­er, and On the Ones and Threes’s mix­ture of indie, alt, and (good) prog styles, while not exact­ly unique any­more, is cer­tain­ly refresh­ing to hear done so well. To top it all off, On the Ones and Threes con­nects its var­i­ous ele­ments beau­ti­ful­ly. The instru­men­tals of “Into Blue,” are per­fect­ly craft­ed to sup­port Fontaine Toups’s espe­cial­ly melod­ic vocals, and the same goes for Richard Baluyut’s more ener­getic “Sat­ur­day Saints.” And of course, the com­bi­na­tion of both vocal­ists is sim­ply on anoth­er lev­el. The octaves and har­monies of “Invin­ci­ble Hero” are both inter­est­ing and excel­lent, and when every­thing comes togeth­er per­fect­ly, like on “Pink Val­hal­la,” the results are stag­ger­ing. 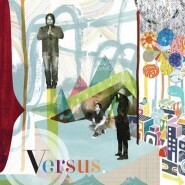 After a ten year hia­tus, it’s impres­sive that Ver­sus has put out an album at all. That it’s an album as good as On the Ones and Threes is excel­lent. On the Ones and Threes shows the band in top form - as cre­ative as ever, with the extra devel­op­ment of ideas and skill that gap has allowed. All in all, Ver­sus has cre­at­ed an out­stand­ing album, com­bin­ing a num­ber of well-craft­ed ele­ments into a mas­ter­ful­ly built whole.